This project was created on 04/07/2018 and last updated 9 months ago. Solar lantern with a joule thief and an astable multivibrator for people to learn soldering and basics of electronics. Ideal for kids. Pitch for this hackaday prize. This is a kit to introduce people(especially kids) to the exciting world of electronics. I wish I was taught basic electronics and soldering since high school, but unfortunately they still don&apos;t teach this in most high schools across India. So I made this solar lantern kit for people to learn electronincs and soldering. This can be used by people of all age but my primary focus was school kids. 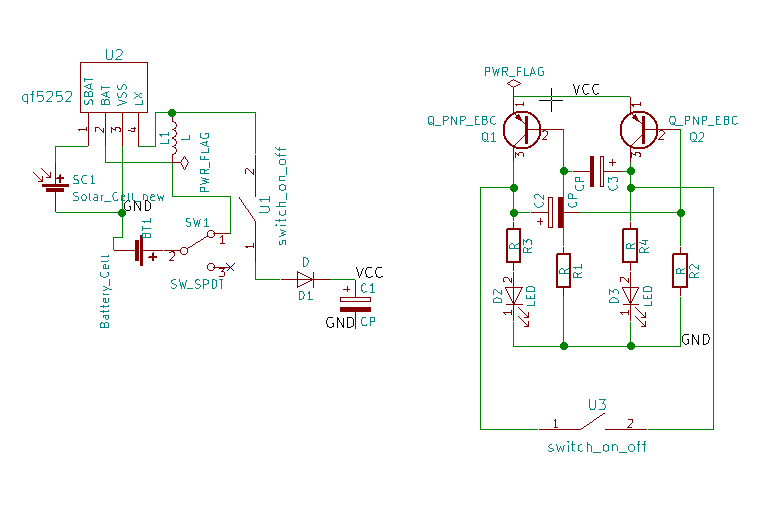 The entire circuit runs on a 1.2V NiMh battery which gets charged by a 2V solar panel. The board has got a qf5252 ic. This is a tiny but very interesting ic which serves as a switching boost converter and solar charge controller. It only need and external inductor for boosting a 1.2 volt NiMh battery sufficiently high to light LEDs. It runs at a frequency of around 100 Khz. I filtered the spikes from the boost converter and added an astable multivibrator to blink two leds alternatively to make it more fun for kids. This blinking mode can be disabled with a switch so that the lantern will glow continuously. So, after distributing kits to kids at hillhacks last year few complained that fully charged lantern is getting discharged even when the lantern was switched off via switch U1 in the previous schematics. After a closed inspection I realised that q5252 ic has some leakage current which discharges the battery within one day. 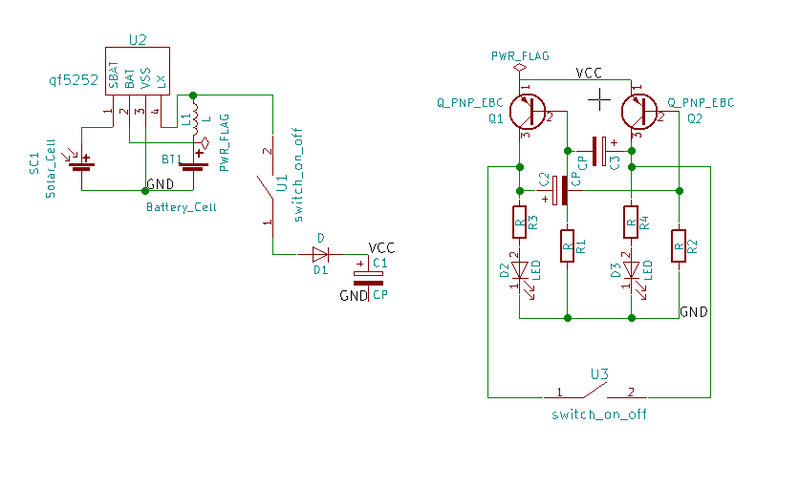 To fix this I have added an another switch SW1 next to the battery (just for this version though, see below schematics). So now people can store a charged lantern in dark by switching off this switch and there won&apos;t be a leakage of current. Caveat is that to switch on the lantern again we will have to switch on two switches now, i.e. both SW1 and U1. This is not the best design whch I will try to fix in the next version. At Knowledge Garden, Upper Bagsu Dharmashala, India. As a part of HillHacks school program we conducted a soldering workshop at TCV Suja. The school is located at the foot steps of Dhauladhar mountains of Himalayas. The view from the school is breath taking. I wish I had a school like this. Around 30 students from 6th grade participated in the workshop. To my surprise some kids soldered better than few adults at Hillhacks :), probably because they had more hands as can be seen in the below photo. quick question? Do you provide a case or cover for these? It just seems like they&apos;re very susceptible to damage after they are built. Anyway. I was looking at your project and thought that if you had a nice slim cover like a small sleeve (maybe printed) and instead of the square solar panel you could use a rectangular 78mmx28mm one (ebay item 263585914090). You could integrate it on one side of the case as well (glue or press-fit). This would give a more finished-product feeling while making it last a bit longer. Really inspiring! All the best. Nice project and cool looking PCB! Cheers! where do you get your PCBs from? Cool project, @Nitesh ! That photo with the kids looking at the light is really nice. @Nitesh Looked up hillhacks for this year - it was in my TODO list ! Thanks for the information. May 18-31... My crowdfunding campaign will be running at that time, unfortunately. What to do ? How much does one kit cost, if we intend to introduce in Experimental Education System. You are about to report the project "Solar Lantern Soldering Kit", please tell us the reason.